China’s digital out-of-home media (DOOH) industry was surging toward 40 percent annual growth in the third quarter of 2012, and the country’s blistering expansion pace may drive it past the United States as the world’s largest market in 2013, according to PQ Media. Revenues generated by China’s DOOH network and billboard operators were pacing for 40 percent year-over-year growth in the third quarter of 2012, which would push the Chinese market past the $2 billion mark for the year, trailing only the United States, and gaining fast. An accelerated 2012 performance followed a 39 percent expansion in 2011, when China became only the second market besides the United States to exceed $1 billion in annual DOOH revenues, according to preliminary data released from the “PQ Media Global Digital Out-of-Home Media Forecast 2013-2017.” In real dollars, the Chinese market expanded by more than $400 million in 2011, nearly doubling in size compared with 2009. Digital place-based networks in a range of venues, such as corporate, transit and cinema, accounted for about two-thirds of China’s DOOH revenues in 2011, while digital billboards operating in various OOH locations comprised the rest. Digital billboard revenue expanded faster, but both DOOH segments produced enviable double-digit growth in the fastest-growing market among the world’s regional leaders. China’s strong growth drove global DOOH revenue up 15 percent to nearly $7 billion in 2011 and was the catalyst fueling 20 percent growth in the first half of 2012, according to the “PQ Media Global Digital Out-of-Home Media Forecast 2013-2017.” By comparison, U.S. DOOH revenues increased 11 percent in 2011, and were on an accelerated pace in the first half of 2012, although second-half trends may have impacted the final growth outcome. China is home to some of the largest and fastest-growing DOOH companies in the world, including Focus Media, AirMedia and VisionChina, as well as divisions of Phoenix Satellite TV and Beijing Bashi Media. China’s DOOH industry has, by far, the most digital screens of any global market, with Focus Media operating more than 200,000 screens in the corporate and healthcare office vertical alone. VisionChina reportedly operates more than 100,000 digital screens throughout this market’s vast transit system. 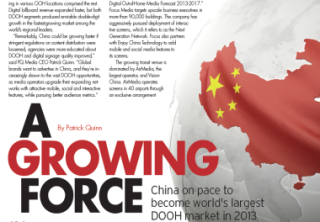 China’s corporate and healthcare network vertical is the market’s largest venue category, accounting for about one-quarter of all DOOH industry revenue, according to the “PQ Media Global Digital Out-of-Home Media Forecast 2013-2017.” Focus Media targets upscale business executives in more than 90,000 buildings. The company has aggressively pursued deployment of interactive screens, which it refers to as the Next Generation Network. Focus also partners with Enjoy China Technology to add mobile and social media features to its screens. The growing transit venue is dominated by AirMedia, the largest operator, and VisionChina. AirMedia operates screens in 40 airports through an exclusive arrangement with nine airlines, as well as a smaller network at gas stations. VisionChina has more than 100,000 screens deployed in subways and bus systems in about 25 cities, including exclusive agreements to manage digital signage in the Shenyang public transportation system and DOOH networks in Guangzhou subways. China’s cinema network vertical is expanding rapidly, as the country surpassed Japan in 2012 as the world’s second-largest film market behind the United States. Cinema operators have moved fast in recent years to upgrade China’s theaters by installing the latest digital screen technology. Focus Media is the largest cinema network operator with nearly 2,000 screens in almost 300 theaters in early 2012, a three-fold increase from only 100 theaters in 2008, outstripping Filmore Media’s network of 1,200 screens in about 200 metroplexes. IMAX is also aggressively expanding its screen deployment in China, working closely with the Wanda Cinema chain to increase its footprint to 50 screens by year-end 2012. Large global OOH operators are helping to spur China’s growth, as well, but they often need to partner with a China-based OOH operator to achieve significant success. For example, JCDecaux helps to manage AirMedia’s digital airport signage, while Clear Channel’s AdShel partners with Clear Media to operate digital signage and CBS Outdoor collaborates with Clear Media to manage Beijing Bashi’s digital bus network. The PQ Media Global Digital Out-of-Home Media Forecast 2013-2017 is the sixth edition in a series that has become the industry’s leading benchmark for revenue, growth and trends, providing in-depth data, insights and perspective on all four global regions and 28 leading markets. PQ Media tracks the global DOOH industry by the two major media platforms and six venue and location categories, including cinema, retail, corporate and healthcare, entertainment and education, transit, and roadside.